When I was younger, I would flip through my parents family albums of their life in the 70s; their photographs, all taken with a 35mm camera, were printed on photo paper smaller than 4"x6", the edges were rounded and most were fading in color from the album itself. The old archival photo albums had a 'self-stick' page that held the photos in place with a plastic sheet folded on top to supposedly protect the surface of the print; however, the page contained a harmful adhesive that actually ruined a photo rather than preserving it. In this day and age, old photos can be restored through a difficult and lengthy, but not impossible, process called 'retouching & photo restoration' using digital software. Today, there is something truly nostalgic about holding photographic prints and flipping through pages of a photo album. We now exist in a digital era. Technology continues to advance as we view photographs in real time on tv, computer screens, and mobile devices, from almost anywhere in the world. The way we share photos and stories have significantly evolved, changing the way we communicate and connect to one another. But, I'm still a little 'old fashion', in the sense that I absolutely love print work – magazines, books, newspapers, etc. Last year, I advertised 'photo books' to my inner circle of friends, family, and clients on my personal FB. I encouraged my clients to invest in having a photo album created so that they could have their memories archived all within one beautiful book, rather than having their photos stored on a DVD that might be viewed once or twice a year. I have always been a fan of large coffee table art/photo books. So, to make a dream a reality (having my work published in a book), I decided that I would produce photo books and have them published for clients. After researching labs online, I finally discovered a print lab that was able to print high-end photo books on real silver halide photo paper, which is an upgrade from the average consumers low-end press printed books that use inkjet printers and stock papers. 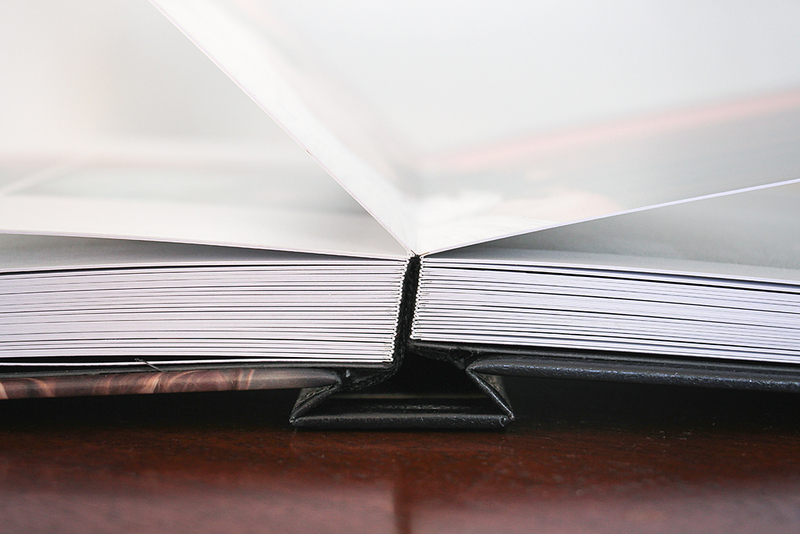 These high end albums are hand bound, flush mount / layflat, thicker, and stronger (pages don't bend). The seamless tones and lustre finish is desirable for anyone seeking a personal custom layout photo book with such beautiful characteristics. Here are photos of my first book created for the beautiful newlywed couple, Lauren & Bowe McGinnis. 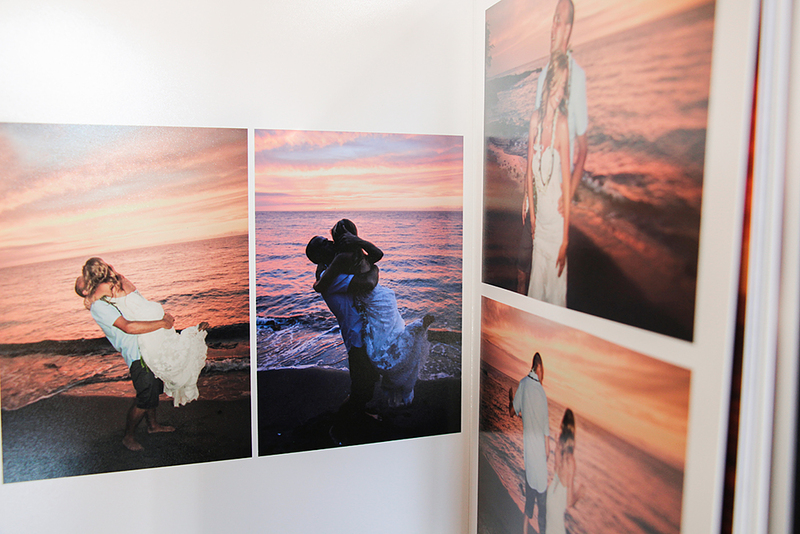 Photographs selected by Lauren & Bowe McGinnis from their wedding photo collection. Photographs Captured by Me and Danny Casler on Big Island, HI. 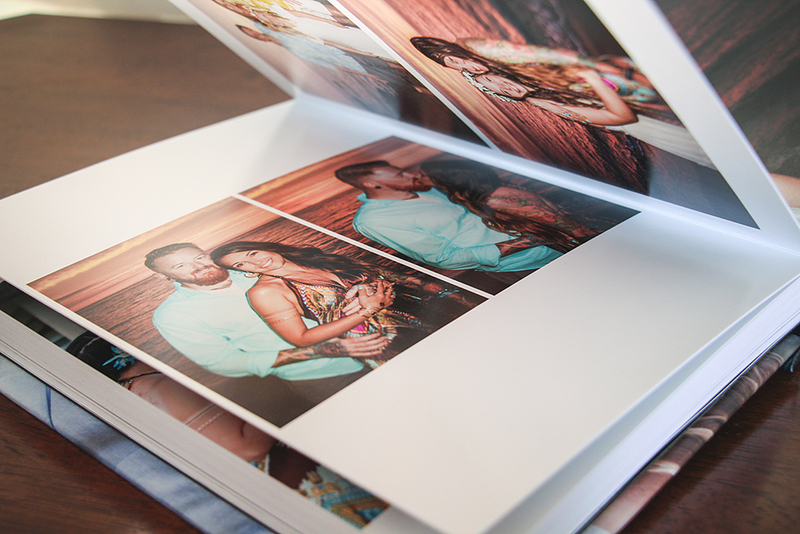 This is the 8"x11" Flush Mount Photo Book with 92-pages containing 184 photographs.